The Sumo Collection is defined by its simple yet powerful lines sculpted with a well proportioned stainless steel base and legs that are matched to thick and wide pieces of teak. The Sumo Lounger and Ottoman Set is a perfect complement to any of the Sumo Series pieces or as a stand alone piece that will make a dramatic statement in any garden or setting. The Lounger has been ergonomically designed for comfortable relaxed seating along with the ottoman which can be ideally placed for users of all heights. 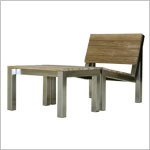 All pieces are crafted of heavy gauge stainless steel and teak.